The expanse of glittering water surrounded by hilly olive groves, rows of vineyards, and thick woods known as Lake Trasimeno is one of the most popular destinations for travelers to the central Italian regions of Umbria and Tuscany. The fourth largest of Italy's lakes, Trasimeno is ringed with tiny Medieval stone villages perched atop promontories jutting into the water. Crumbling towers, stoic fortresses, Renaissance churches, and contemplative abbeys dot the rolling countryside. The lake itself is colored by bright sails and tiny pastel wooden fishing boats, set against the background of three pretty lake islands, and its fiery orange sunsets are known to be some of the most dramatic in Italy. The lake is located inside the region of Umbria (see map), though the northern lakeshore closely hugs the border into neighboring Tuscany. The Trasimeno basin stretches as far west into Tuscany as Montepulciano and as far north as Cortona. The nearest major city is Perugia, about 20 kilometers to the southeast. Top rated hotels in lake towns include Hotel La Vela in Passignano sul Trasimeno, Bed and Breakfast Villa Sensi in Tuoro sul Trasimeno, and Hotel La Torre in Castiglione del Lago. There are several campgrounds around the lake. For self-catering apartments on an organic farm, Il Fontanaro has several guest house options near the village of Paciano, about 13 kilometers from the lake. The two nearest airports are Aeroporto Internazionale dell’Umbria (San Francesco d’Assisi), about 35 kilometers southeast of Lake Trasimeno in Sant’Egidio, between Perugia and Assisi, and Aeroporto di Firenze (Amerigo Vespucci), located just outside of Florence, about 140 kilometers northwest of Lake Trasimeno along the A1 Autostrada. Lake Trasimeno is easily reached by car from the A1 Autostrada from either Florence (exit at Valdichiana) or Rome (exit Fabro or Chiusi-Chianciano Terme). Several lake towns sit along the rail lines of Milan-Florence-Rome (Castiglione del Lago, Chiusi-Chianciano Terme, and Terontola stations) and Ancona-Foligno-Florence (Magione, Passignano sul Trasimeno, and Tuoro sul Trasimeno stations). Check train schedules on Trenitalia. In addition to the above trains, local buses connect towns around the lake and ferries go to the islands. See Umbria Mobilita (in Italian only) or check schedules in the towns. The lake is ringed by a series of roads which alternate between stretches of highway (primarily around the north end) and stretches of local road (primarily the south end). Towns directly on the lake have a resort atmosphere and outside the high season, running from April through October, visitors may find that many restaurants, accommodations, shops, and other services are either closed or have limited hours. From spring through fall, the lake is buzzing with visitors enjoying the mild climate, sunny beaches, and pretty walking and biking trails—though the most crowded months are the summer season including June, July, and August. In the days surrounding Italy’s May 1st holiday, the Coloriamo i Cieli festival fills the skies near Castiglione del Lago with brightly colored kites, as enthusiasts gather to fly their creations over Lake Trasimeno. In Passignano sul Trasimeno, locals celebrate the Palio delle Barche in late July, when runners dressed in Medieval garb race through the streets down to the lake’s waters carrying their boats on their shoulders. In August, Città della Pieve holds their own palio, the Palio dei Terzieri, featuring archers attempting to hit a “bull’s-eye” on revolving wooden bulls. During July and August, Trasimeno Blues festival organizes music concerts, exhibitions, and events in a number of towns and venues around the lake. The lake’s wine, olive oil, fish and legumes are famed for their excellence due to the Trasimeno basin’s microclimate. Fagiolina del Trasimeno, the heirloom legume resembling black-eyed peas, cook into a creamy, flavorful soup or side dish that pairs well with the freshwater lake fish, including tench. Other local fish include catfish, carp, eel, smelt, shrimp, and perch. 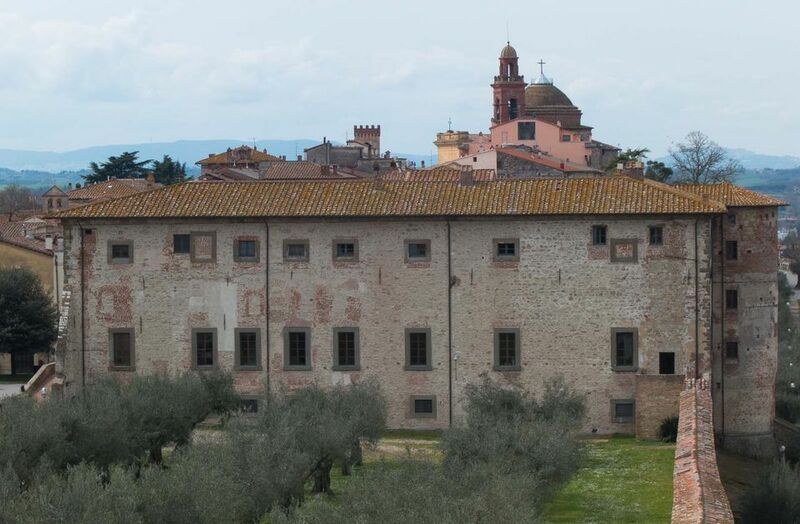 Extra virgin olive oil, Olio d’Oliva del Trasimeno, is produced from the vast olive groves covering the hillsides. Its fruity flavor, with an undertone of bitter and spicy accents, is perfect for the lake fish. Pair this meal with Vino Colli del Trasimeno, one of the local light red or white wines. The largest island in Lake Trasimeno is Isola Polvese, virtually abandoned when it was purchased in the early 1970s by the Province of Perugia, who established a natural park here in 1995. Its a mecca for nature lovers, including birdwatchers who enjoy the fowl that populate the wetlands and hikers who explore the pretty stretches. On Isola Maggiore, the second largest island, visitors can visit the tiny Medieval village, once a bustling center for hundreds of fishermen and their families, but now home to less than 20 permanent residents. Isola Maggiore is known for its intricate Irish lacework-- there's a Lace Museum dedicated to this local art on the island—and for Castello Guglielmi, built on the remains of a 1328 monastery commemorating Saint Francis’ stay on the island for the 40 days of Lent. Castiglione del Lago, a postcard-perfect resort town perched on a small promontory jutting out into the lake, is one of the lake's most visited destinations. This popularity comes as no surprise, as its panoramic position above the water, dramatic Rocca del Leone fortress with walkable parapets, a plethora of restaurants and shops, and languid, friendly air make it a perfect base for visiting the surrounding area or a day-trip. As its name suggests, Passignano sul Trasimeno sits right on the shores of Trasimeno. Another popular destination, it's also the closest point of departure for ferries headed to Isola Maggiore. Its pretty historic center is topped by a 14th-century castle and below it is a long stretch of beach and grassy park dotted with sun umbrellas where lounging vacationers watch windsurfers and sailboats navigate the waves. This is all one would expect from a resort town. Tiny, unassuming San Feliciano has none of the art and culture that draw visitors to its more picturesque neighbors, but that doesn’t mean that it isn’t worth a stop. Home to Lake Trasimeno’s fishing cooperative, this is also one of the few spots where you can see the traditional flat-bottomed wooden boats and old men of the lake hand-mending their fine nets. It was at Tuoro sul Trasimeno where Hannibal’s historic trouncing of the Roman soldiers led by Flaminius on June 24​th, 217 BC, took place. For history buffs, the walking or driving route Percorso Storico Archeologico della Battaglia, marked by signposts and viewing platforms with explanatory notes and maps, is a fascinating way to recreate this disastrous (for the Romans) battle. Monte del Lago is set on a minuscule promontory over the waters of Lake Trasimeno. One visits this Medieval stone center not to “see” but to “be”, soaking in the slow pace and contemplative air of this quiet spot surrounded on three sides by lakeside views. The village is set along one of the quietest stretches of the Grande Anello Trasimeno, or Large Trasimeno Ring, a biking or walking path tracing the circumference of the lake, alternating between dedicated trail (marked by signage for the“PCT—Percorso Ciclabile Trasimeno”, or Trasimeno Bike Route) and trafficked roads.